The clue window contains the clue editor. The clue editor allows you to define / modify a clue. The General panel defines the most important settings of a clue. 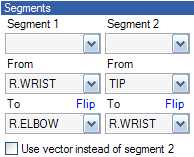 The Segments panel allows you to change the definition of the segment(s). 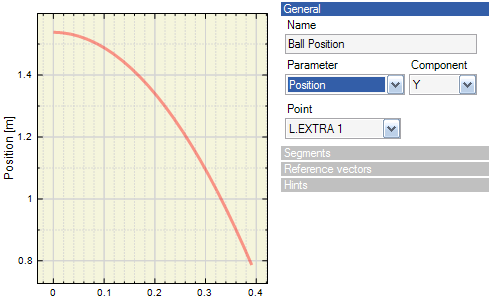 When you select a parameter that requires two or more points (distance, angle, angular velocity, or angular acceleration), the segment panel becomes active. Select the two points manually. A segment can be defined between any two points. The angle between a segment (through two points) and a reference vector. The vector used to "look at" the angle. This is only applicable in 2 dimensions. The reference vector used rather than a second segment. The Hints panel allow you to determine how a clue is visualized in a chart, renderer, or view editor. Enables/disables a shadow on the floor. Used in the view editor. Enables/disables projection lines to the floor. Used in the view editor. Color of a line or chart. Used in chart, renderer, and view editor. Segment width in pixels. Used in view editor. 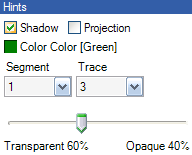 Trace width in pixels. Used in chart and view editor. Transparency/opacity of line or chart. Used in chart and view editor. Generated on 4/22/2019 5:02:43 PM (PST) ADI/HQ/GBA/2019/ARIELCLOUD/v3.0.2018.0126.